A research team led by University of Pennsylvania Professor of Medicine and LDI Senior Fellow Scott Halpern has received an $11 million PCORI grant for the largest study ever done comparing different strategies to help lung cancer screening patients to stop smoking. The trial will include 3,200 current smokers from underserved populations who are referred for lung cancer screening at Penn and three other health systems: Geisinger Health System, Kaiser Permanente South California, and Henry Ford Health System. "These patients are particularly likely to smoke and have historically not benefited as much from programs designed to promote quitting," PCORI announcement said. "This study will also evaluate if different interventions work better for specific groups; for example, for people of different races, ethnicities, incomes, and degrees of tobacco dependence." 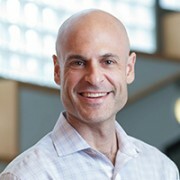 Halpern, MD, PhD, is a Professor of Medicine, Epidemiology, and Medical Ethics and Health Policy at the Perelman School of Medicine, and directs both Penn's Palliative and Advanced Illness Research (PAIR) Center and the Fostering Improvement in End-of-Life Decision Science (FIELDS) program.